We are no longer taking RSVPs for this event. If there are any open seats at 7:25PM, we will release them to those who have not registered. Please wait in the "wait list" line in front of the Barclay Theatre. “Making Memory: Pathway to our Future"
Our public lectures are held at the Irvine Barclay Theatre and are FREE and OPEN to the public. Seating is first-come, first-served for those who have registered. Please plan to arrive early. Doors to the lobby open at 6:30PM. Doors to the theatre open at 7:00PM. Parking is available for $10 in the lot adjacent to the Irvine Barclay Theatre. Please click here for directions. There will be fun booths with raffles, brain games, giveaways and even a real human brain that you can hold in the lobby! 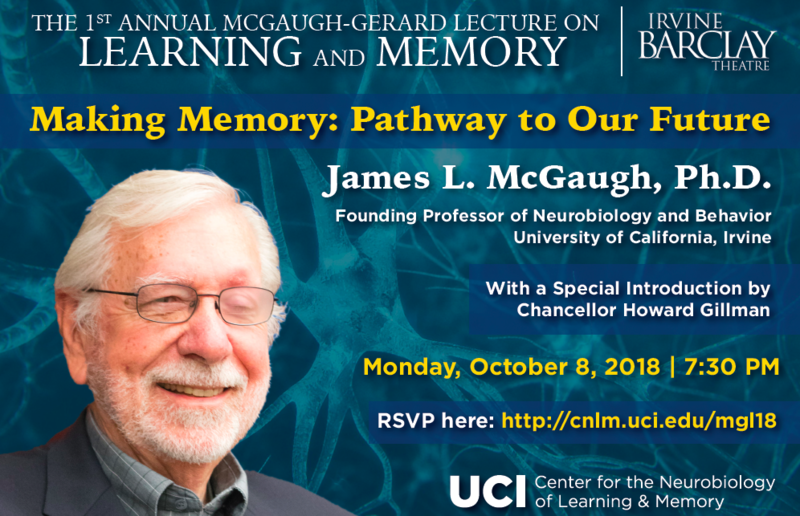 Dr. James McGaugh is the Founding Director of the Center for the Neurobiology of Learning and Memory and the Founding Chair of the Department of Neurobiology and Behavior (formerly Psychobiology). He is currently Distinguished Professor Emeritus in Neurobiology and Behavior and is internationally recognized for his studies of drug and hormone influences on memory as well as his more recent work on Highly Superior Autobiographical Memory. Dr. McGaugh has served as Dean of the School of Biological Sciences as well as Vice Chancellor and Executive Vice Chancellor of the University of California, Irvine. Dr. McGaugh is the recipient of countless awards and honors in the United States and around the world including being a member of the National Academy of Sciences, receiving the Grawemeyer Award for Psychology as well as the UCI medal. In 2001, the University of California, Irvine honored Dr. McGaugh by naming a building after him, McGaugh Hall. The McGaugh-Gerard lectures are made possible by the McGaugh-Gerard Endowment that was established by Dr. James L. McGaugh and the family trust of the late Dr. Ralph W. Gerard. The lectures are free to the public and are intended to encourage public education, scientific discourse and exposure to world class science. Drs. McGaugh and Gerard were friends and colleagues who shared a mutual respect for one another as well as for their research in neuroscience. Dr. Gerard arrived at UC Irvine in 1964 and helped founding Chancellor Daniel G. Aldrich, Jr. organize the new campus. He was appointed the first Dean of the Graduate Division. Dr. McGaugh also arrived at UCI in 1964 and was interviewed by Dr. Gerard for the position of founding chair of Psychobiology, which is now known as the Department of Neurobiology and Behavior. Of Gerard, Dr. McGaugh remarks “I felt privileged to know him, as he had a highly distinguished career in physiology and was one of the founders of the Society for Neuroscience. After he retired he invited me to meet with him in his home on Friday afternoons for many interesting discussions of science, campus activities and other matters.” It is a fitting tribute to Gerard’s memory and the two scholars’ friendship that this lecture bear their names together. We extend our sincere gratitude to Dr. McGaugh and the Gerard family trust for their philanthropy in establishing this important lectureship at the CNLM to enrich the lives of future generations.